Growing up, opening up gifts from our stockings in front of the fireplace was my favorite part of Christmas. My mom individually wrapped every single thing inside, so that we’d have more to open. And my brother and I would take turns unwrapping everything. 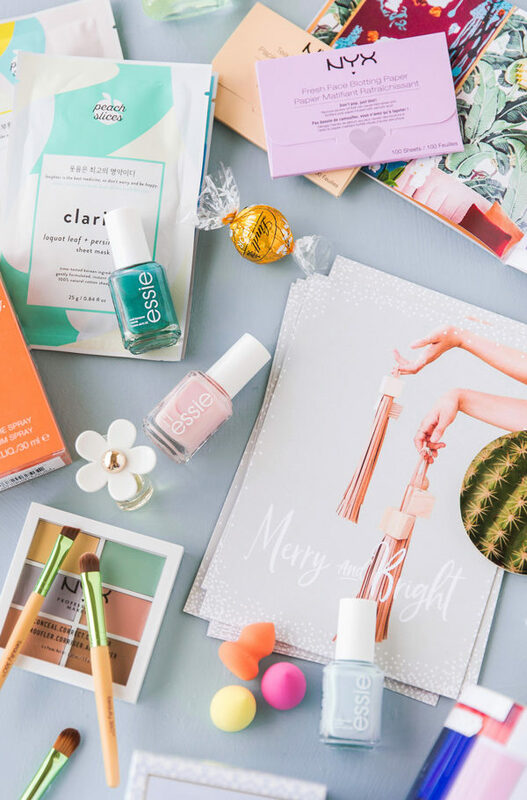 The presents usually ranged from typical stocking stuffers like candy and lip gloss to ‘bigger’ items that were more personalized or special. Oh the memories of Christmas as a kid! To keep that magic going this year, I’m sharing some fun stocking stuffers, with a little help from CVS. AND there’s even a DIY stocking tutorial to go with it! 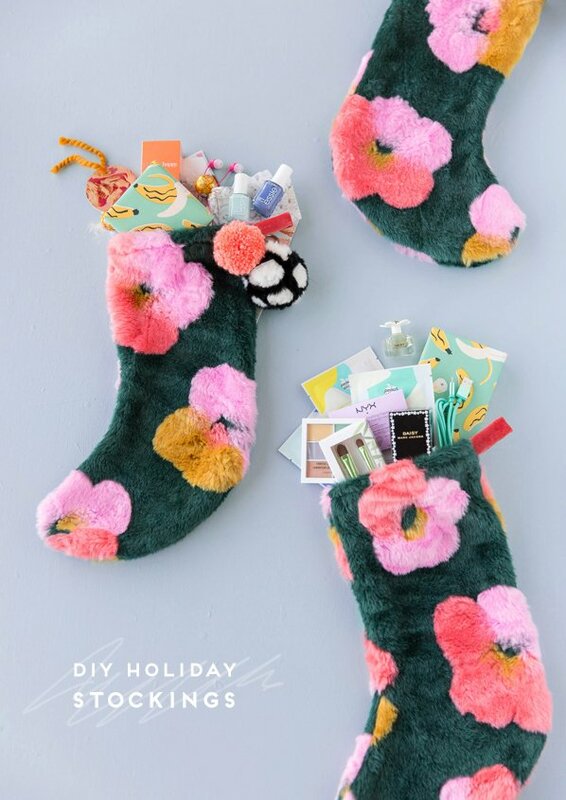 Yes, those faux fur stockings are a DIY project. To make things interesting, I’ve challenged myself to base the stocking AND the stocking stuffers inside on a theme – pop art, Andy Warhol style. 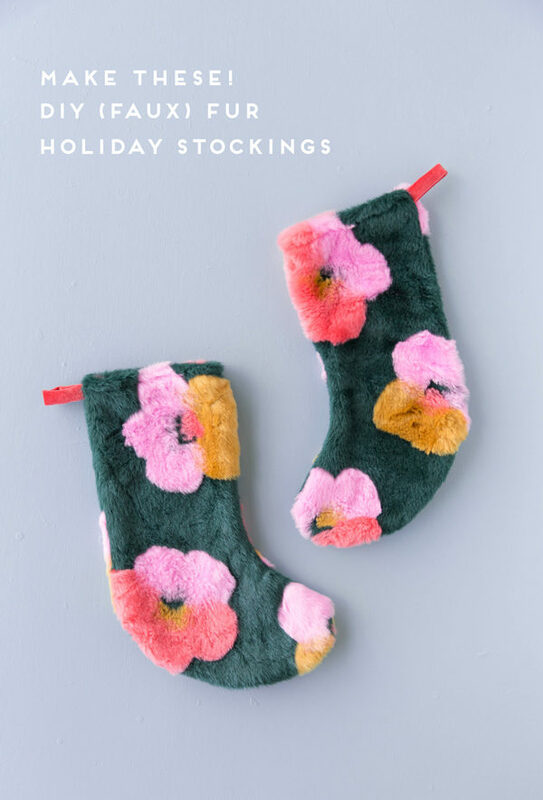 Hence the furry flower pattern for the stockings, based on Warhol’s flower series. Click through for the full breakdown, along with the tutorial for this furry pop art stocking situation. 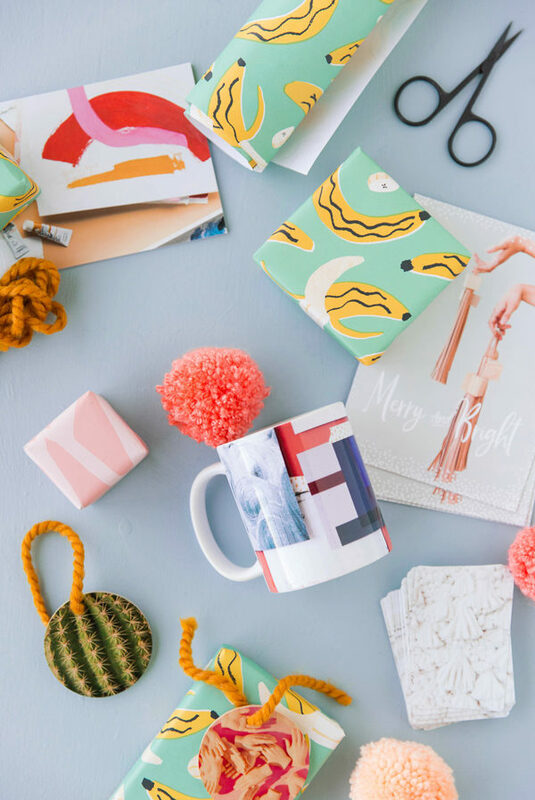 But first, stocking stuffers please! 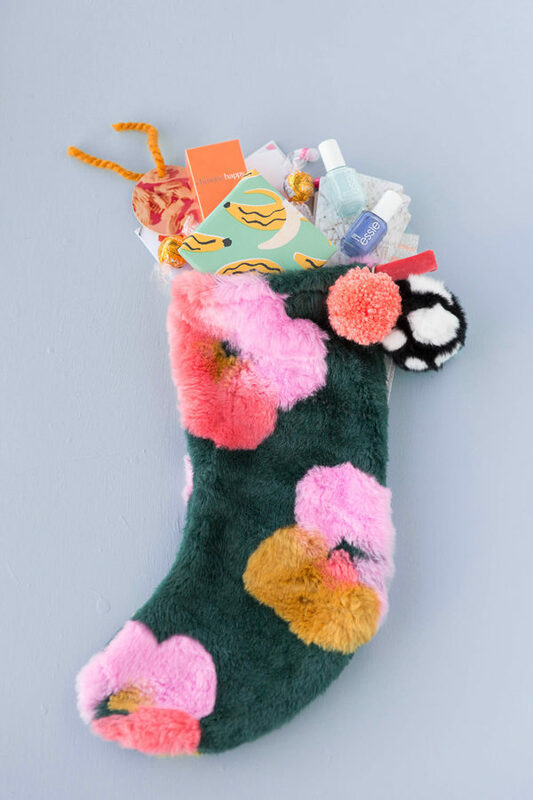 Every item stuffed in these stockings is from CVS – the colorful beauty products (like those spa masks with the awesome packaging), the designer perfumes, even the custom photo gifts from CVS Photo. I made a photo mug, two wood ornaments from old photos, the merry and bright holiday cards, a mini photo book, even a stack of playing cards. All good stocking stuffer options btw! CVS takes their job as a convenient spot to escape hectic shopping very seriously, especially in the stocking stuffer department, because they’ve dedicated a whole week to it. Literally! December 17-24 is #StockingStufferWeek and CVS has ALL of the things to fill your stockings in one place this season. And in case you’re wondering…I already had the banana wrapping paper. Too perfect not to use for an Andy Warhol themed stocking, right? Now, who wants to make a stocking?! 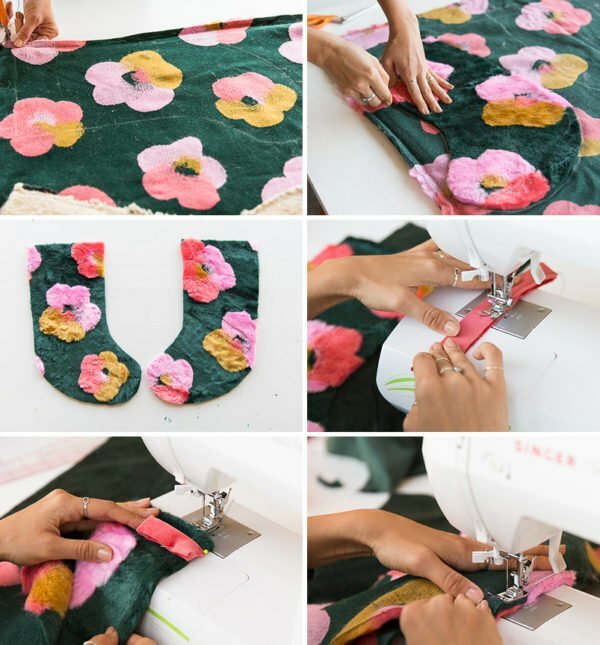 Quick FYI – This stocking tutorial is for an unlined DIY stocking. The faux fur is pretty thick and sturdy and the back of the fabric is finished enough looking to go unlined. If you’re looking for a lined stocking tutorial, check out this one: lined DIY stocking tutorial. Start by steaming or ironing your fabric so it’s free of wrinkles, etc. Flip the fabric so the wrong side is facing up, then chalk the outline of your stocking. You can go with a traditional shape (tracing an old stocking you have) or free handing an entirely new one. 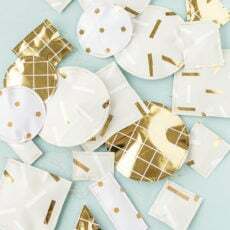 Cut out that first piece and then use it as a template for the second piece (which will be the back of the stocking). Note: Be sure to put the wrong sides together when cutting the second piece, so that they’ll be mirror images of on another from the front and back. As shown in photo. Next, create a rectangular shape (roughly 5.5 by 2 inches) out of velvet for the stocking loop (where the stocking will hang from). Then fold right sides together (like a hot dog) and stitch to close the long rectangle shut as shown. Then turn it right side out. Fold it in half to create a loop and attach 1/2 inch below top edge on the backside of the stocking like the photo, with a straight pint. Then put right sides of stockings together (on the inside) and stitch all the way around using your preferred seam allowance (in this case, it was a 1/2 inch). Flip the stocking right side out. Then, finish the top of the stocking by folding it in 1/2 inch and stitching all the away around. You can do this part of a sewing machine or by hand, if its easier. Then they’re ready to hang and be stuffed with mini stocking stuffer gifts! I can picture them on a millennial pink painted fireplace already. Can’t you? P.S. To make it even easier to find what you need exactly when you need it, there’s a CVS Pharmacy mobile app! Users can shop via the app, place an order and have it delivered right to their car door with CVS Curbside pickup. Including holiday cards from CVS Photo – which are available for same-day pickup. Yes please! What do you think? Have you ever done a fully-themed stocking stuffer holiday? ALSO, very curious to know… Would you ever consider changing up your stockings each and every year or do you like to use the same one year after year?! I’m proud to be partnering with CVS Pharmacy to help spread the word about their photo services. All opinions expressed are my own, and all product claims or program details shared should be verified at CVS.com or with the appropriate manufacturers. 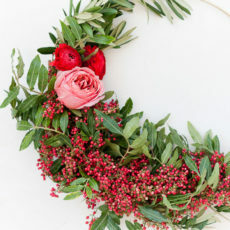 < previous postDIY Holiday Entertaining: My Tiny Party Reveal for the Holidays + $500 Giveaway! That stocking idea is so cute!! I love how colorful they are. Thanks Courtney! The faux fur print really helps pull in that pop art vibe. What a unique idea, I really like that they’re not traditional for a change! Love the pattern! Love everything about this!!! The stockings are lovely. And the mug too! And of course the banana paper. Thanks Sara! Much appreciated. The mug is one of my fave pieces I ordered from CVS Photo. I´ve just discovered your blog. It´s so inspiring! 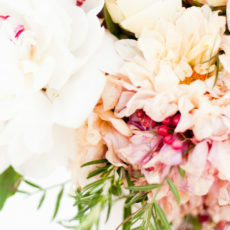 Love your ideas, colour palettes and photos! Thanks Pink Pineapple. Happy Saturday!